JD Mohler Heating & Air Pros is licensed and insured. 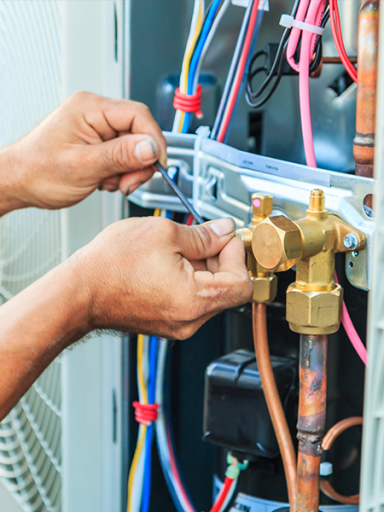 Our AC technicians will always fix the problem, and best of all without breaking your budget! We are dedicated to giving you the best service and easiest solutions for all of your AC needs. For your convenience, we are open 24 hours a day, 7 days a week near you. And we are always looking to uphold that we are the best cooling, and refrigeration company. We can recharge an air conditioning unit, de-ice it, complete general repairs, or anything AC-related. No job too big, or budget too small for us to fix your cooling. We offer air conditioning solutions for residential homes. All of the repairs we perform make your air systems run more efficiently, while saving you money in energy bills. You can count on our air conditioning technicians to thoroughly inspect your system, explain any issues or processes and provide you with effective and affordable solutions. If what you need is an AC/Central Air Conditioning Repair Company, we hope you’ll choose JD Mohler Heating & Air Pros. For prompt, professional service, send us an email or give us a call today. We give free estimates on full system change outs. Joshua Mohler is an expert in the service, installation, and repair of residential air conditioning and heating units, as well as, indoor air quality. He is is NATE certified and also holds an EPA certification. Joshua personally guarantees that whatever service is performed, or whatever product is installed, it will be done promptly and professionally. If you have any questions or want to make an appointment with an HVAC technician, give us a call today! We are an authorized supplier of Goodman and Amana systems. Every Goodman has a 10 year Warranty on all replacement parts (new unit registration required). Amana qualifying systems, 16 Seer or higher, have a Lifetime Warranty on compressors! which is unheard of in the air conditioner industry. Goodman, Amana, Trane, Carrier, Bryant, Payne, Tempstar, ICP, Broan, Heil, Rheem, Mitsubishi, Gree, Aaon, Greenheck and many more.